Note for battery replacement: Please refer to the photo on right side of this page for the correct orientation to insert the battery into the battery cradle. There are indicators inside of the cradle that indicate positive + and negative - polarities, be sure to align the correct terminals on the battery to these indicators. 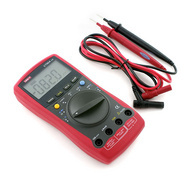 Please Note: The included instruction manual indicates that a CD, RS232 cable, and 9V battery should be included, but the item we are selling does not include these.